The Roll is using Machine Learning technology to analyse photos. 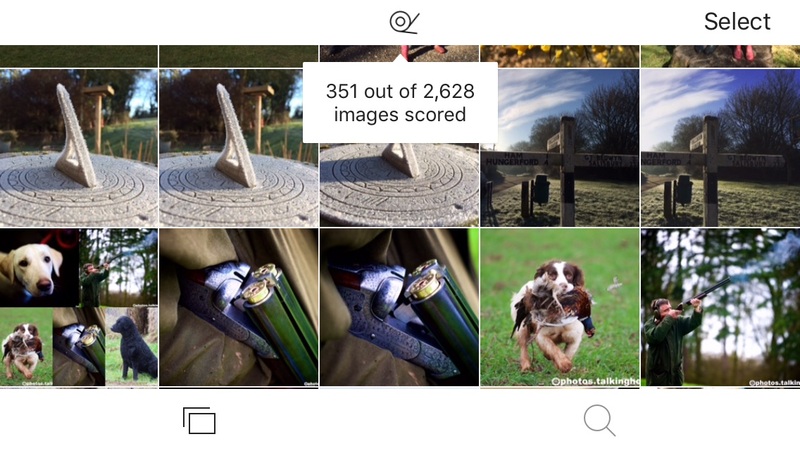 It uploads thumbnails from your camera roll and then runs those through a set of algorithmic rules to produce an ‘aesthetics’ score and image recognition to apply tags. I’m not sure if it’s using Natural Language Processing in anyway to produce tags, I suspect not, and instead is using some form of semantic taxonomy. What adding these tags does is makes finding the images you want much easier than with the current iPhone photos app. I can usually remember where I took a photo, but not necessarily when, so having one of the categorisations as places is very useful. Just as useful is having them categorised into things, like in my case, dogs, horse and children, etc. Whilst I am excited by the app and will probably continue to use it, it is very much a first version which needs a few wrinkles ironed out over the coming iterations. Some of these will undoubtedly come about by the very nature of the beast as the machine learning improves, others require a little more product management thought, and some are just fundamental user experience issues. This app is good though, and a concept long over due in our smartphone camera happy world. I have hundreds of pictures of dogs in my camera roll, just about all of them have been tagged as “animal” and “canine”, some even tagged correctly as “labrador retriever” yet not one of them is tagged as a dog and dog is the search expression or categorisation I would use to find these pictures. There is a similar issue with the large number of horse photos too. Some are tagged as Horseback riding, some as horse, others just as herbivorous, others as neither. Tags like “childhood” and “elementary age” appear where you might expect child or children. A natural language classifier would solve all of these problems. All this useful tagging is only available within the app itself. The meta data isn’t being appended to the image, and in fact the app loses metadata if you share an image out of the app, rather than the normal camera roll. The app must be copying the image to the sharesheet in such a way as to loose all meta data. (see below). One of the real benefits of the app is now lost as soon as you take the photo out. This auto-tagging exercise is very valuable as it can save days and weeks of work. However the app doesn’t seem to let you edit these, so you’re slightly stuck with what your given. It would be useful for both user and the tagging engine if users could add tags, giving users familiar phrases and the system with more data with which to learn. Allowing users to add captions would be additional bonus. Once you set the ball rolling, allowing the app to upload thumb nails to its servers, there’s no way to stop it or pause it. For the initial upload that is a huge battery burner, and your phone becomes very hot. There is no user account and there are no settings for the app, which is unusual for a company that has such a massive user base. Which sort of makes you wonder what their purpose of releasing this was. Without a user account it becomes far less appealing for so many reasons, including security. There’s no doubt the image recognition is very good and I have high hopes for this app. If you’d like to read more about the tech EyeEm’s Head of R&D explains the tech behind The Roll. I’m a huge fan of EyeEm, and their aspirations, and I’m looking forward to the next few iterations of this app.